With this unique and diabolical method, you will leave them stunned! The Spectator's MARKED coin is put at risk... but they have insurance! The valuable contents of a small envelope THEY HOLD from the start. They MARK the coin, assuring the use of NO DUPLICATES. The envelope is waved over their coin, and the coin immediately VANISHES! The hands are shown empty and the envelope is shown to be UNPREPARED as it is opened, only to reveal ANOTHER smaller envelope inside. This envelope has an even smaller one within. A nest of FIVE envelopes are opened in this way until the smallest inner envelope is opened BY THE SPECTATOR. Absolutely inexplicable... it must be MAGIC!!! - Simple reset means instant magic! - Diabolical method a million-dollar secret! - No difficult palming, pocket work, or fake appendages! Use ANY borrowed, marked coin - penny, nickel, dime or quarter. You will have at your fingertips a daily miracle pulling you center stage! I know you like to perform every time someone asks to see a trick. Here's a comfortable solution for an ever-ready killer! Inner Change is a self-contained device, featuring intimate architecture and efficient durable construction! Like its companion effect, Emergency Cash, Inner Change is a model of efficiency you can perform completely surrounded! New automatic transfer technology gives you the power to control the coin at all times, without any sort of conventional slide! Inner Change is another evolutionary turning point for magic's most intriguing plot, a borrowed object to impossible location. The routine and device work together weaving strict conditions and open handling. 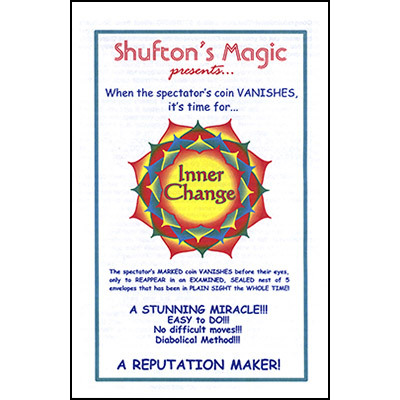 Inner Change comes complete with 8 pages of full color, fully illustrated instructions with handling, presentation, patter and tips for performance! Extra mini envelopes included! Inner Change is hand made with strict attention paid to every detail. This is magic the way you want it: entertaining, powerful effect and easy to do. A professional prop for real workers - reset is a snap and lets you do what you do best - entertain. Always ready to bend minds.